Protection from falling objects. This is especially true in the mining, construction and manufacturing industries. Accidents happen often in these environments but in the right pair of rubber boots, you won’t need to worry. 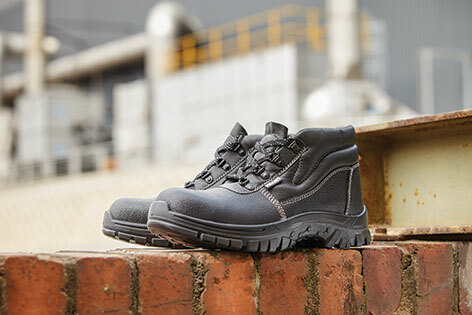 Frams safety footwear is manufactured with steel toe caps for increased peace of mind. Prevent slips, trips and falls. Wet and muddy conditions are a reality in the construction and mining industries. Rubber safety footwear lessens the risk of falls with specialised soles that are slip-resistant even in the most testing of conditions. Prevent fatigue. The Frams Vulcanised Rubber Sole Range offers those who wear them increased comfort for the long hours spent working on their feet. This allows for a more comfortable and productive workforce. Protection from burns. Burns are a reality in environments where harsh substances like acids, chemicals and even cements are used. Rubber safety footwear provides an effective barrier between feet and dangerous substances, eliminating the risk of burns. High temperature protection. Rubber safety shoes are a must when working in high temperature environments like mining and manufacturing. The Frams Vulcanised Rubber Sole Range can withstand heats of up to 300 degrees Celsius without warping, buckling or melting.